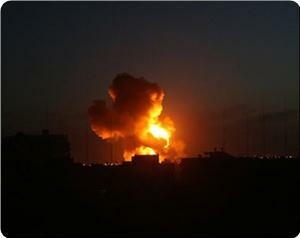 Two Palestinians were killed in an Israeli airstrike on the central Gaza Strip late Sunday, a Ma'an reporter said. Two members of al-Quds Brigades, the military wing of the Islamic Jihad movement, were killed as Israeli warplanes struck al-Bureij refugee camp. The two were identified as Mazen al-Hadba and Marwan Salim. 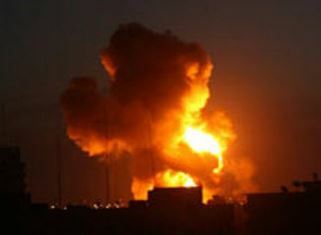 An Israeli army spokeswoman said the air force had "managed to prevent a rocket attack" from the central Gaza Strip. "A hit was confirmed," the spokeswoman said. She said that 25 rockets fired from Gaza hit Israel on Sunday. Israeli forces late Sunday fired several artillery shells at the southern Gaza Strip, witnesses said. 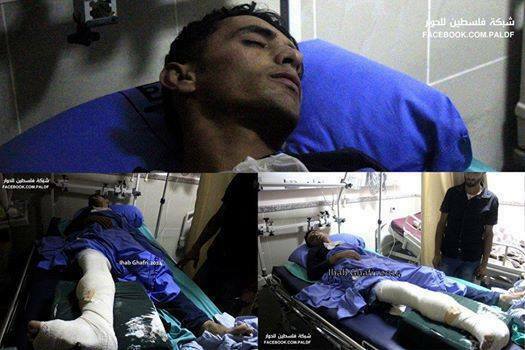 Locals told Ma'an Israeli forces shot artillery shells at the al-Matar area east of Rafah. Two shells were fired, with no injuries were reported, the sources said. An Israeli army spokeswoman did not immediately return calls seeking further details. Over a dozen Palestinians were hurt early Sunday during clashes with Israeli forces north of Hebron, medics said. A volunteer for the Palestinian Red Crescent told Ma'an 15 Palestinians received first aid treatment after being hit by rubber-coated bullets in al-Arrub refugee camp. Ambulance services also evacuated three families after tear gas filled their homes, the volunteer said. During clashes, Palestinians hurled stones and empty bottles at soldiers who fired tear gas, stun grenades, and rubber-coated bullets, he said. 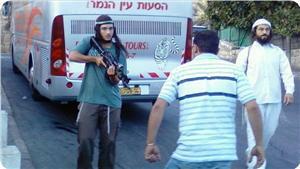 Similar clashes took place elsewhere in the Hebron district, he added. Jerusalem court releases Tariq Abu Khdeir on bail; Tampa teen remembers little of incident. 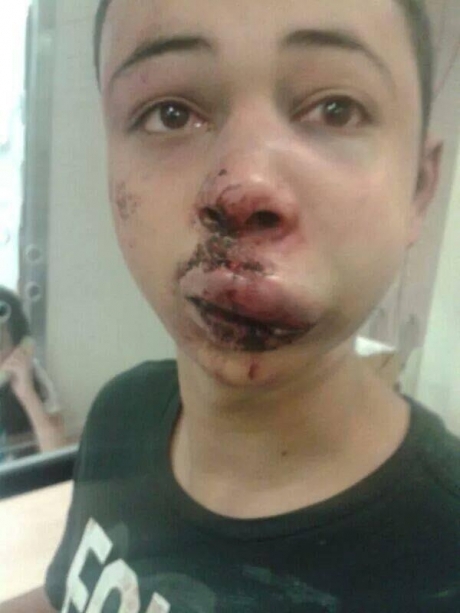 A Jerusalem court released US-Palestinian teen Tariq Abu Khdeir on bail Sunday morning. Khdeir, whose cousin was brutally murdered last week, told reporters he vaguely remembered the vicious beating he received. "I was attacked by police. I woke up in the hospital." Khdeir, suspected of throwing Molotov cocktails and rocks and of injuring an officer, was detained last Thursday. A video clip circulated on the Internet on Saturday showed two Israeli border police holding down and repeatedly pummeling a masked youth before carrying him away. "I remember standing and watching the group of people. They came from the side of me and I tried to run away," he told reporters. The family of Khdeir, from Tampa, Florida, who was visiting relatives in East Jerusalem, says he was the target of the punches, although the footage is blurred and the victim cannot be identified as he appears also to be wearing a head covering. A later part of the video shows Khdeir's face with a heavy black eye and swollen lip. He is a cousin of Mohammed Abu Khdeir, the youth whom Palestinians believe was abducted and murdered by far-right Israelis on Wednesday. The Israeli Justice Ministry said in a statement that the police investigations department was looking into the incident. Police spokesman Micky Rosenfeld said Khdeir was one of six rioters caught and detained in the incident, three of whom were found to be carrying knives. State Department spokeswoman Jen Psaki confirmed that Tariq Khdeir was visited by a consular officer on Saturday. "We are profoundly troubled by reports that he was severely beaten while in police custody and strongly condemn any excessive use of force. We are calling for a speedy, transparent and credible investigation and full accountability for any excessive use of force," Psaki said. Israeli forces fired stun grenades at a Palestinian TV crew covering clashes between Israeli troops and young Palestinian men in al-Tur neighborhood in East Jerusalem on Saturday. Witnesses told Ma’an that Palestine Today satellite channel reporter Ahmad al-Budeiri and his cameraman were hurt after Israeli soldiers fired stun grenades directly at them. 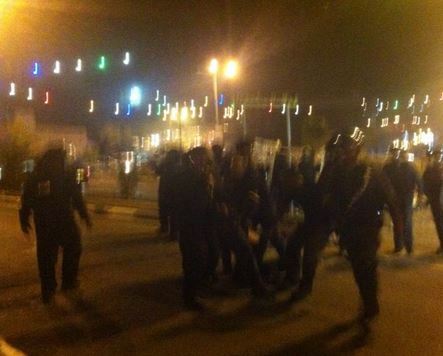 Three protestors were hit by rubber-coated bullets during the clashes. One was taken to hospital and had seven stitches in his foot which was cut by a rubber-coated bullet. In the same neighborhood, Israeli forces fired stun grenades at a group of young men walking in the main street and forced them to go inside a coffee shop. Separately, Israeli troops detained four young Palestinian men during fierce clashes in the Ras al-Amoud neighborhood in the Old City of Jerusalem. Also, witnesses said an Israeli settler fired gunshots into the air near the Christian Quarter in the Old City. 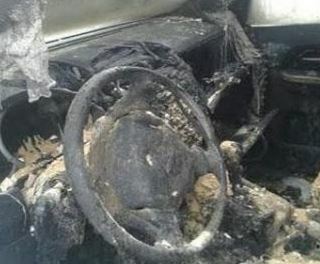 The Raya News Agency has reported that Israeli soldiers invaded Barta’a village, southwest of Jenin, in the northern part of the occupied West Bank, fired gas bombs and concussion grenades, and deliberately caused fire to fifteen cars. Injuries were also reported in the nearby Zabbouba village. Tawfiq Qabaha, member of the Barta’a Village council, said dozens of soldiers invaded the village, and rolled burning tires into a parking structure belonging to Ahmad Tawfiq Aziz Qabaha, causing five to fifteen cars. Firefighters managed to contain the fire, while medical sources said dozens of residents received treatment for the effects of tear gas inhalation. 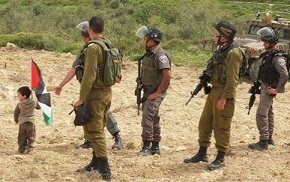 In Zabbouba village, near Jenin, dozens suffered the effects of tear gas inhalation after dozens of soldiers invaded the village, and clashes with local youths who threw stones and empty bottles at them, late on Saturday at night. Jenin Governor, Ibrahim Ramadan, denounced the ongoing aggression by Israeli occupation soldiers, and fanatic settlers, in different parts of occupied Palestine. “The aggression aims first and foremost at creating further violence and chaos”, Ramadan stated, “The international community needs to act fast and stop the Israeli aggression and escalation”. An unidentified Palestinian man was critically wounded Friday night when he was shot in the chest by Israeli troops near the electrified fence surrounding the Gaza Strip, according to the Ma’an News Agency. The incident took place in central-eastern Gaza. The agency reports that the Israeli military told them that they fired at several people near the border who they suspected of trying to plant explosive devices. No such explosive devices were located. 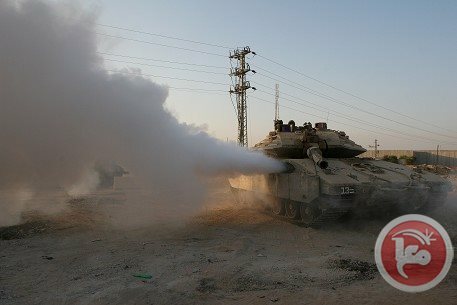 Israeli troops also fired tank mortar shells into eastern Rafah on Friday, but no injuries were reported from that attack. The Israeli military told reporters from the BBC that a total of six homemade shells were fired from the Gaza Strip into southern Israel on Friday, causing no injuries. One of the shells reportedly cut a power line to a house in Sderot. As the nightly Israeli air raids in Gaza continue for the sixth straight day, the Hamas government told a BBC reporter that they were willing to call for a ceasefire if Israel agreed to stop its nightly air raids. Israeli officials told the same reporter that it is up to Hamas to declare a unilateral ceasefire, and then Israel will see what it will do. A Tampa, Florida boy who was visiting relatives in Jerusalem when he was grabbed by undercover Israeli officers and badly beaten in the face and head received a visit from U.S. officials Saturday, in advance of his court hearing Sunday. Tariq Abu Khdeir, 15, is the cousin of Mohammed Abu Khdeir, who was burned to death on Wednesday morning, apparently by the same group of Israelis who were seen forcing him into a car outside a mosque in Shu’fat, East Jerusalem just before 4 am on Wednesday. Despite video footage of the abduction, and the license plate number having been captured by eyewitnesses, the Israeli police have failed to identify or detain the killers of Mohammed Abu Khdeir. The day after his cousin’s murder, 15-year old Tariq was grabbed by undercover Israeli forces in Shu’fat, where protests had broken out calling for justice for Mohammed. A witness in a nearby apartment building captured video footage of the attack, which shows three men holding and repeatedly beating a prone Palestinian with their fists and other objects. He was then carried into a police van and taken into custody with dozens of other Palestinians who had been swept up in the police crackdown on the protests. Police denied him medical treatment for over five hours, despite his badly-swollen head and broken nose. U.S. officials rarely intervene in cases involving Palestinians detained or brutalized by Israeli forces, even when those detained are U.S. citizens. In this case, however, with extensive family connections across the U.S., the Abu Khdeir family have pressured U.S. officials to take action – particularly since the family has already suffered the loss of 16-year old Mohammed, who was burned to death, presumably by Israeli settlers, on Wednesday. The Palestinian Prisoner Rights group Addameer also took up the case of Tariq Abu Khdeir, stating, “No charges or accusations have been brought against Tarek, yet his despite his young age and unlawful treatment, his detention has been extended until the morning of Sunday 6 July in the Court of First Instances in Jerusalem. “Tarek is one of 11 Palestinians who were beaten and arrested in Shofat last night following the brutal murder of 16-year old child Mohammad Abu Khdeir, who was found beaten and burned on the ruins of Palestinian destroyed village Deir Yassin hours after he was kidnapped in a retribution act. 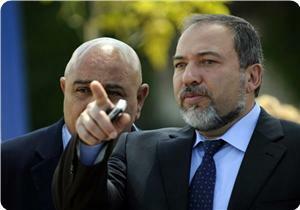 The Israeli government has instated a gag-order regarding the circumstances of Mohammad’s kidnapping and murder. “The continued state-sanctioned violence against children is unlawful and unacceptable. A Palestinian teenager identified by local sources as the cousin of the 16-year-old who was murdered on Wednesday was beaten and abducted by Israeli police on Thursday, and was refused medical treatment for his broken nose and other injuries while in custody. The Palestinian Red Crescent Society has reported that over 170 Palestinians have been injured since Monday, when the bodies of three Israeli teenagers who had gone missing two weeks earlier were found. 15-year old Tariq was allegedly participating in one of several protests that took place in Shu'fat and nearby areas after Muhammad Abu Khdeir, 16, was abducted by Israelis, according to eyewitnesses, and later found burned to death on Wednesday. Hundreds of Palestinians took part in the protests, which were met with tear gas, rubber-coated steel bullets and concussion grenades. At least three incidents have been reported of Israeli police and military using live ammunition against the demonstrators. Of the 170 injured since Monday, at least six are journalists. Since his death Wednesday, the family of Muhammed Abu Khdeir has faced interrogations, DNA tests and a misinformation campaign started by the Israeli police to claim, based on no evidence, that the boy was killed in a family dispute -- in addition to the Israeli police refusing to look at surveillance video showing the assailants, which would normally be a major part of an investigation. The attack on the 15-year-old appears to be the latest affront to a family that is mourning the brutal death of a child. Tariq is a Palestinian-American who was staying with family in Jerusalem when he was beaten and abducted by Israeli police. The full extent of his injuries is still unknown. The Israeli Air Forces carried out a series of air strikes targeting different areas in the Gaza Strip, causing excessive damage and several injuries. The WAFA news agency has reported that Israeli F-16 jets fired three missiles into agricultural lands, and a building, in Rafah city, in the southern part of the Gaza Strip. Several residents, mainly children, suffered anxiety attacks, and minor injuries. Two more missiles were fired into the al-Fakhary area, in Khan Younis, in the southern part of the Gaza Strip, causing damage to a number of homes. In Gaza City, the Israeli Air Force fired one missile into a farmland, close to the Cars Market, in the Zeitoun neighborhood of Gaza City, causing damage to a number of homes and buildings. Local sources said Israeli drones and F16 jets can still be seen and heard flying over different areas, in the coastal region. The Israeli Police kidnapped 32 Palestinians during mass protests in different parts of the country, following the abduction and murder of Mohammad Abu Khdeir, in Jerusalem. The Arabs48 News Website has reported that that 13 children are among the kidnapped, adding that ten Palestinians were taken prisoner in Nazareth, 10 in the Southern Triangle area, and the rest were kidnapped in Wadi ‘Ara, and Arab villages in the northern part of the country. 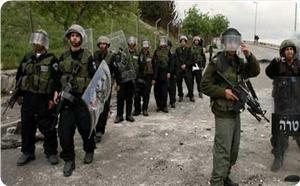 The Police said all kidnapped Palestinians will be sent to court, and that it intends to conduct further arrests. 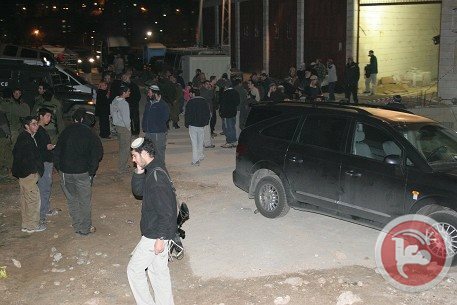 The Arabs48 said stated eleven Palestinians were kidnapped, on Sunday at dawn, in Nazareth, Um al-Fahem, Ein Mahel area near Nazareth, and Baqa al-Gharbeyya. 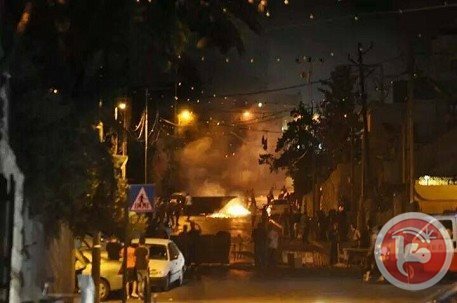 Two were taken prisoner in Nazareth and four in Ein Mahel, allegedly for throwing stones at the police during ensuing clashes. 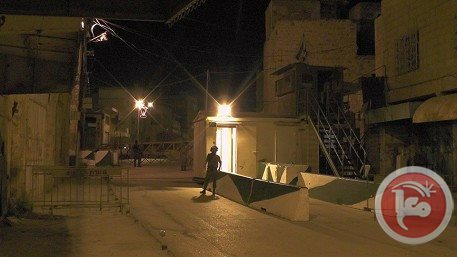 Three were taken prisoner in Um al-Fahem, and two near Baqa al-Gharbiyya Junction. Um al-Fahem clashes lasted until late night hours, Saturday, and the police fired dozens of concussion grenades, gas bombs, and used water cannons against the protesters. Clashes also took place in the Old City of occupied Jerusalem, as around 200 Palestinians protested the murder of Abu Khdeir, and ongoing violations, while police officers and soldiers fired dozens of gas bombs and concussion grenades. In related news, a number of Israeli extremists invaded Beit Safafa town, south of occupied Jerusalem, and threw stones at local residents leading to clashes. Meanwhile, the District Court in Haifa decided to keep eight Palestinians under interrogation “for protesting in Wadi ‘Ara”, in the Haifa District. Aharon Eksel, Israeli Police District Commander in Tel Aviv, said around 10.000 Israeli police officers have been deployed in various Arab cities and towns, in historic Palestine, “to counter the ongoing protests”. He told the Israeli Radio that the police “is trying to prevent further clashes” through various channels including “holding talks with influential Arab leaders”. A team of volunteer lawyers is representing the detained Palestinians, who are facing charges that include “participating in illegal protests”, “disrupting the peace” and a few are accused of attacking police officers. Ministry: Israeli attacks on farmers' property incur damages worth $2.5 m.
Ministry of Agriculture estimated the damage cost of the Israeli airstrikes on Israeli ex-settlements (now cultivated land) in southern Gaza Strip city of Khan Younis at $2.5 million. The ministry Friday explained in a statement that the Israeli bombings destroyed greenhouses set up on land with 70 thousand square meters (70 dunums), 15 dunums of citrus crop, 10 dunums of grapes, 20 dunums of vegetables and 30 storehouses with farming equipment. The bombardment also led to the destruction of irrigation and electricity systems, agricultural equipment and ready-to-market crops, in addition to causing deep holes in the land. The Al-Makassed Islamic Charitable Society Hospital received dozens of injuries during the last 72 hours following clashes that erupted in Jerusalem Thursday night. Some 147 injuries were treated in the hospitals including some that were reported as serious which were caused by live fire. Others were between moderate and light, caused by rubber-coated steel bullets. The general manager of the hospital said that many injuries needed surgery, and one of the most critical injuries was a fracture in the skull caused by a rubber-coated bullet. Dr Rafiq al-Husseini added that several injuries were caused by batons which caused fractures in the hands, legs and other body parts. Some arrived to the hospital suffering from burns caused by stun grenade shrapnel, and some were choked by tear-gas canisters in addition to injuries in the eyes. The manager said the hospital was “ready to receive all cases of injures,” and he highlighted the hospitals’ need for donations of medicine and medical supplies to be fully prepared for the “large numbers” of injuries. 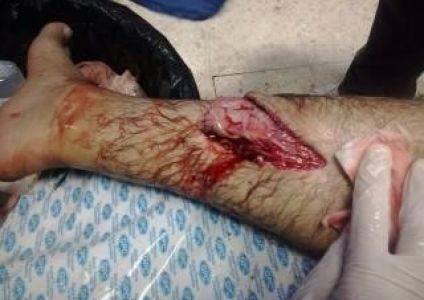 A Palestinian boy was injured in clashes with Israeli troops near Qalqiliya early Saturday, medics told Ma'an. 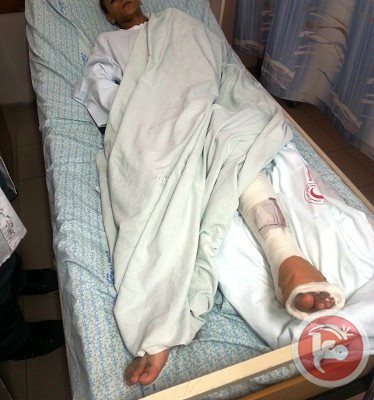 Palestinian Red Crescent medics said 13-year-old Ahmad Mashhur Mardawi was hit by 15 rubber-coated bullets in his leg during overnight clashes with Israeli troops in Jaljoulia south of Qalqiliya. Ahmad was taken to Darwish Nazzal Hospital in Qalqiliya. Renewed violent clashes were reported in occupied Jerusalem at dawn Saturday and Friday night between angry Jerusalemites and Israeli police forces. Locals said that the clashes took place in most suburbs of occupied Jerusalem, adding that young men closed streets with burnt tires and rocks and threw firebombs and stones at Israeli policemen. Masked youths blocked Jerusalem railway lines as Israeli police and border guards heavily fired teargas to disperse the demonstrators, protesting Jewish settlers’ cruel torture and murder of a Palestinian Jerusalemite boy a couple of days ago. Palestinian medical sources have reported that dozens of Palestinians have been wounded, late on Friday at night, during clashes with Israeli soldiers at the northern entrance of the al-‘Arroub refugee camp, north of the southern West Bank city of Hebron. The sources said six Palestinians were shot by rubber-coated metal bullets, while at least two were directly hit by gas bombs fired by the army, and suffered burns and bruises to various parts of their bodies. The soldiers prevented Palestinian Red Crescent ambulances from entering the camp, and the medics had to walk into the camp to provide the needed treatment to the wounded Palestinians. Scores of residents suffered the effects of tear gas inhalation, and some lost consciousness, as the soldiers fired gas bombs at different homes, especially homes close to the military tower, at the entrance of the camp. The families had to leave their homes and seek shelter elsewhere due to the massive number of gas bombs fired by the soldiers. 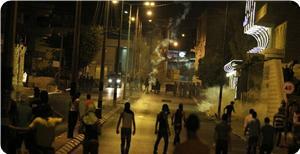 Clashes also took place in the southern area of Hebron city, especially in the Old City, and Tareq Ben Ziad junction. Dozens of residents suffered the effects of tear gas inhalation. 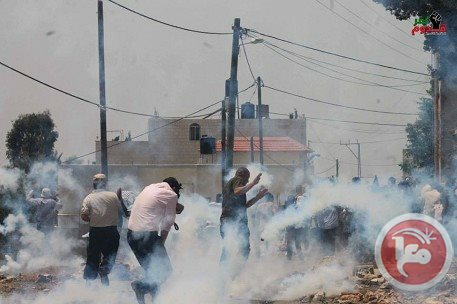 On Saturday at dawn, soldiers invaded Barta’a ash-Sharqiyya village, southwest of the northern West Bank city of Jenin, and fired rounds of live ammunition, rubber-coated metal bullets, gas bombs and concussion grenades, causing dozens of residents to suffer the effects of tear gas inhalation. The army left the village two hours later, no arrests were reported. Also on Saturday at dawn, several Palestinian communities in the West Bank district of Bethlehem, searched homes and kidnapped three Palestinians. The soldiers also installed roadblocks, isolating two villages. Israeli foreign minister Avigdor Lieberman expressed his rejection of a ceasefire agreement with the Hamas Movement in the Gaza Strip and described it as a big mistake. During his visit to Sderot settlement on Friday, Lieberman called for continuing to strike Hamas and its leaders, considering any individual belonging to it a legitimate target. For his part, mayor of Sderot Alon Davidi described the clam Israel seeking with Hamas as misleading. He claimed that Hamas and its allies keep firing rockets every once in a while, and hoped that his government could use the iron fist policy with the Palestinians in Gaza to prevent their attacks on the Israeli residents of the south. 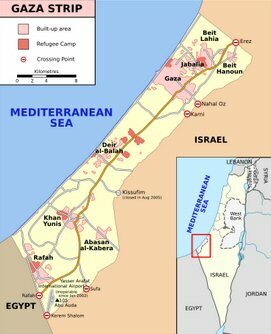 However, political analysts believe that the Palestinian resistance launches rocket counterattacks on empty areas in the south in response to Israel's repeated violations along the Gaza borderline. These violations give the resistance in Gaza the right to defend its people and respond to them, the analysts emphasize. Israel's daily violations in Gaza border areas includes incursions and aerial attacks, destroying agricultural lands and property, attacking fishermen and farmers and opening fire at unarmed civilians. Israeli soldiers invaded, on Saturday at dawn, several Palestinian communities in the West Bank district of Bethlehem, searched homes and kidnapped three Palestinians. The soldiers also installed roadblocks, isolating two villages. 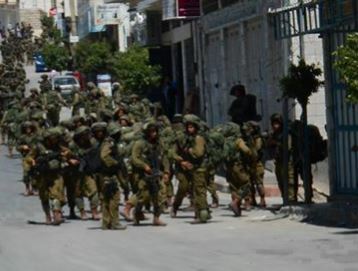 Local sources said dozens of soldiers invaded the al-Asakra area, in Bethlehem, and kidnapped two identified as Abed Mahmoud Asakra, 21, and his brother, Awad, 19, in addition to Yousef Ali Asakra, 20. The soldiers violently invaded the homes of the kidnapped Palestinians, and searched them causing excessive property damage. The army also fired several rounds of live ammunition, concussion grenades and gas bombs, causing a fire close to some homes, but the residents managed to extinguish it before it spread. Also in Bethlehem, troops surrounded the villages of Jouret ash-Sham’a and Um Salmouna, before invading them, storming and searching several homes and stores, and confiscated surveillance cameras and tapes. 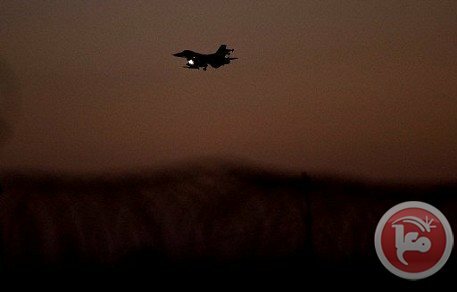 The Israeli Air Force carried out multiple new air strikes on different targets in the Gaza Strip overnight and continued till dawn Saturday. No injuries were reported. Three missiles targeted a military site belonging to the Palestinian security forces southern Gaza Strip, while two shells hit Gaza International Airport, local sources reported. Israeli warplanes also fired at least three missiles at an abandoned land lot to the east of Khan Younis. Along the same line, Israeli tanks fired five artillery shells targeting Gaza International Airport, while a missile hit an open land in Amour neighborhood in Khan Younis. At dawn Saturday, Israeli reconnaissance planes bombed agricultural lands in Qarara area northeast of Khan Younis starting fire in it, and raided another agricultural land near the former Netzarim settlement south of Gaza City. Meanwhile, Israeli drones continue to hover over Gaza. 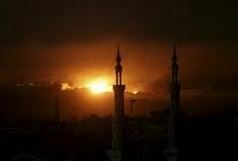 The Israeli Air Force fired, on Friday evening, several missiles targeting Rafah and Khan Younis, in the southern part of the Gaza Strip, causing property damage but no injuries. Local sources said the at least three missiles targeted a Palestinian National Security center, while several missiles were fired into farmlands, in Rafah. More missiles were fired into the al-Fakhary area, close to the border in Khan Younis. Eyewitnesses said the missiles detonated in agricultural lands, and that the army fired several artillery shells into the area, causing anxiety attacks among the residents, especially the children. Israel alleged the recent shelling has nothing to do with truce efforts, mediated by Egypt, and that “Hamas has 24 hours to maintain calm”. 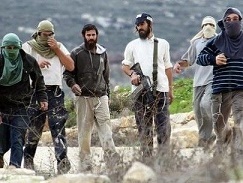 Armed resistance groups responded to the Israeli bombardment by firing several shells into Israeli settlements in the Negev.